Happy New Year. Over Christmas I went pike fishing a few times in my local river. It was often frosty and cold but I was encouraged by my pal Nigel who had not fished for pike before and was very enthusiastic to catch his first. I knew that Nigel had done a fair bit of spinning in the sea so on our first trip we decided to use wobbled dead baits. When you get down to it there is not much difference between spinning for pike and spinning for bass and by keeping on the move I thought it was likely to be warmer and more comfortable (for us, not the pike) than using static dead baits. I sometimes fix a small cork (slit with a razor blade) to the line above my wire trace. This easily adjustable float has the benefits of fixing the depth at which the bait is fished, showing the position of the bait and acting as a bite indicator. 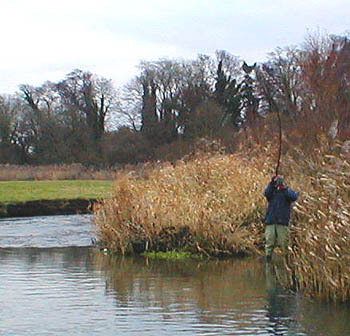 The bait is then cast into likely places (often slack areas with overhead or underwater cover) and twitched slowly back. 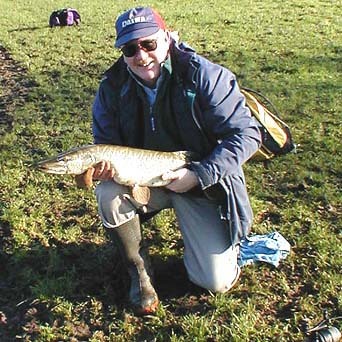 Nigel's first cast resulted in a bite from a fish of five or six pounds which whipped the cork under. Although I could see from his reactions Nigel was "hooked", unfortunately the fish wasn't and after a few seconds it came unstuck. Unusually the pike refused to bite again and we moved on to another spot. 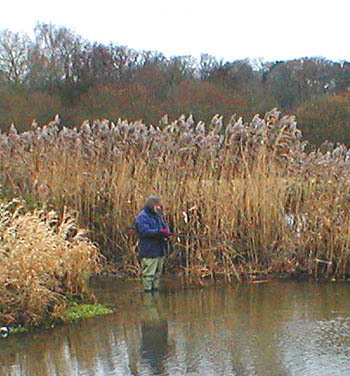 The fishing was slow that afternoon and apart from a decent fish which took my wobbled dace we had no other bites. On our second trip Nigel already had the hang of things and it was not long until his first fish was on the bank - probably the one he had lost on the previous session. I had one (a bit smaller) from the opposite bank and then Nigel landed a beautiful fifteen pounder. Meanwhile a much bigger fish had a go at my bait but managed to avoid the hook. The large fish led a charmed life and each of us managed to miss a couple of takes. By now we were out of bait so we packed in and left "Houdini" for a future occasion. 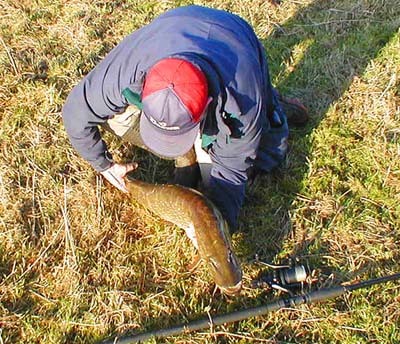 Nigel preparing to deal with a bite from "Houdini" - the pike which kept coming unstuck. 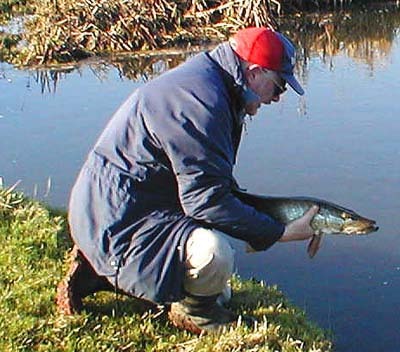 All the pike are carefully returned to the river. It was not long before Nigel had a better fish.